LG Display's CEO, Han Sang-beom, said that the company will make a final decision on its OLED TV panel production capacity investment by early next month. Currently LGD is producing OLED panels in its M1 pilot line in Paju, Gyeonggi but they need more lines for mass production. If they take the decision, they will build the second M2 pilot line in Paju, which will be ready in 2014. According to Han, the OLED TV market in 2013 will be very small, but they expect it to grow to 600,000 - 700,000 units in 2014. In 2015 it will grow further to 3 million units (or about 1% of the total TV market). 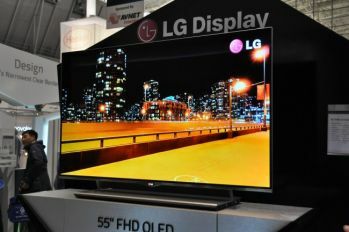 DisplaySearch is more optimistic than LG, saying that the OLED TV market in 2014 will reach almost 2 million units, and in 2015 it will reach almost 5 million units. Last week LG Display finally launched their first OLED TV, the 55" 55EM9700 - which costs around $10,000 in Korea and $12,000 in the US (will start shipping in March). The company is in talks with several Japanese TV makers to supply OLED TV panels, and obviously if they sign such a deal it will make the decision to invest in OLED capacity easier. Regarding flexible displays, LGD admits that they had a late start compared to Samsung, but they are ready to start producing such displays in the second half of 2012.